The Bank of Canada has unveiled the latest bills in its new polymer note series, the $5 and $10 denominations, a move that comes as it highlights progress made in the fight against counterfeit currency. 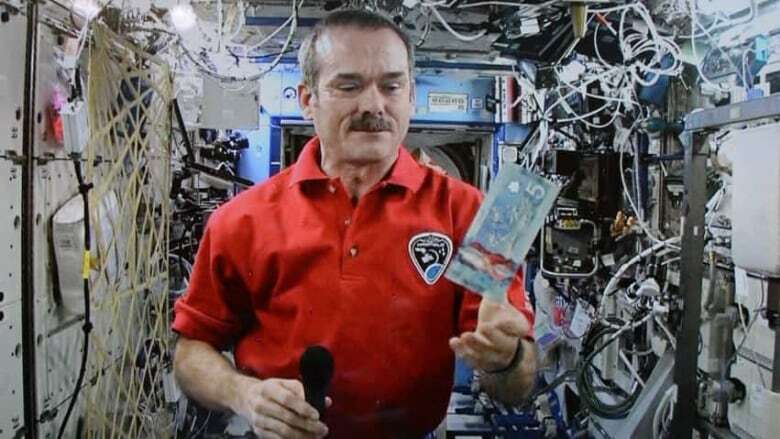 The new $5 note features images of Canadarm2 and Dextre — robotic contraptions that help to build and maintain the International Space Station. The space station's Canadian commander, Col. Chris Hadfield, unveiled the note aboard the space station in a ceremony beamed back to Earth. The new $10 note features an image of a Via Rail train journeying through the Rocky Mountains. The new bills, which won't go into circulation until November, join the already released polymer $20, $50 and $100 banknotes and will mark the final phase of Canada's transition away from cotton-based paper bills. Polymer notes are more expensive to make, they stick together and, some claim, they can melt (the Bank of Canada disputes this). The main reason the Bank of Canada gives for moving to polymer "is to stay ahead of counterfeiting threats." The RCMP have seen just six counterfeit polymer banknotes, which Cpl. Tim Laurence of their counterfeit enforcement team says were all low quality attempts at replication. Even before polymer notes went into circulation in 2011, there had been real progress in the fight against counterfeit currency, which Laurence attributes to enforcement efforts and education programs by the RCMP and the Bank of Canada. In 2012, for the eighth year in a row, the number of counterfeit Canadian banknotes in circulation has fallen. Laurence says the 2006 and 2008 takedowns of one group of counterfeiters accounts for a significant decrease in Canada's counterfeit levels. "In excess of $10.5 million in counterfeit currency was seized, of which $4.5 million of $20s were seized at the print shop before it ever went in to circulation," he told CBC News. With about two billion banknotes in circulation today, there are about 28 counterfeit notes per every million legitimate ones. But that is nothing to sneeze at: The face value of those counterfeit notes is about $1.6 million. The $20 bill continues to be the counterfeiters' favourite, accounting for 68 per cent of all the Canadian counterfeit banknotes passed in 2012. That is significant, but keep in mind that about half of all Canadian banknotes in circulation are $20 bills. And virtually all of these counterfeit notes were of the paper variety. The Bank of Canada expects the transparency, holography, raised ink and other security features of its polymer banknotes will further reduce the amount of counterfeit money in circulation, but these bills are also more expensive to produce. The unit cost of producing a polymer banknote is about 20 cents, compared to 11 cents for the cotton-based paper note. However, according to the bank, the polymers "are expected to last at least 2.5 times longer." 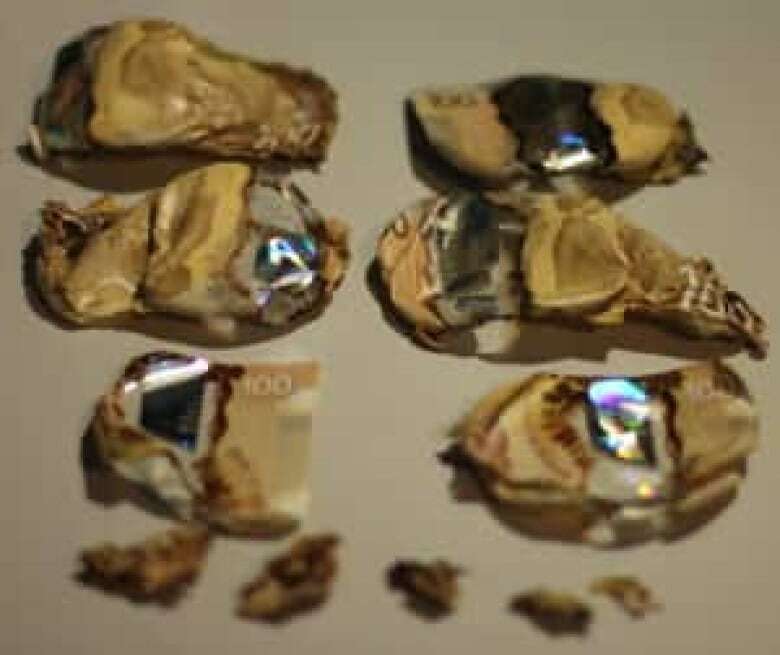 Some Canadians have complained that the new notes stick together and can melt. And some don't like the designs. The bank says the first problem results from how tightly new bills are packaged and can be alleviated by tapping or shuffling the new bills before counting them, whether by hand or machine. As for melting, the Bank of Canada says on its website that "any rumour you have heard about melting notes is merely an urban myth." In an email to CBC News, a bank spokesman elaborated, saying "polymer bank notes cannot be affected by the types and levels of heat as has been suggested in last summer's news reports. The bank has seen no evidence to the contrary since the reports came out." The new polymer notes have been tested by exposing them to 140 C heat and –75 C cold. Other tests use a tumbling mechanism that contains metal bolts, marbles, coffee grinds and/or synthetic sweat to see how durable the notes are, and how they might stand up if left in your pocket when doing the laundry. However, the polymer banknotes can be damaged. The Bank of Canada told CBC News that they have had "232 cases involving mutilated polymer notes." One of those cases concerned eight $100 bills that construction worker Nicholos Billard received as a Christmas bonus in 2011. His mother Mona told CBC News that after he had stored the bills overnight in a sealed tin can near a baseboard heater and behind a couch in their Cambridge, Ont., home, by morning the banknotes had shrivelled and melted. "The top ones kind of curled all up" and the banknotes on the bottom had "maybe half of the bill left, the other half had melted right down," she explained. The bank investigated and Billard was reimbursed, but it took six months. The Billards received no explanation about why it had happened, she says. An access to information request by The Canadian Press for documents related to allegations about melting banknotes resulted in the Bank of Canada releasing 134 pages of internal records. But almost all of the pages, "with the exception of some email headers and previously processed media lines – were blank," CP reported. The latest controversy about the design of the new banknotes surfaced in January, when some botanists alleged that the Bank of Canada has joined a long list of institutions using an image of a non-indigenous species of maple. Sean Blaney, senior botanist of the Atlantic Canada Conservation Data Centre, and Julian Starr, a specialist in plant identification and classification at the Canadian Museum of Nature, both told CBC News that the leaf design on the $20 polymer banknote looks exactly like a Norway maple. "It's a species that's invasive in Eastern Canada and is displacing some of our native species, and it's probably not an appropriate species to be putting on our native currency," Blaney said. The Bank of Canada maintains that it isn't a Norway maple leaf but a stylized blend of different Canadian maple species. "It seems a bit like an after-the-fact explanation to me," Blaney said in response. According to a 2009 report for the bank, which CP also obtained via an access request, early designs for the new $5 and $10 bills also raised complaints. The new $5 banknote features a space technology motif, while the new $10 has a railroad image. CP quotes the report as saying focus groups found the $5 design "looks 'cartoonish' or too child-like," and "the image of the space station is not recognized. It is confused with a concept drawing." On the 2009 design of the $10 banknote, the report says, "while the image is seen as attractive, many do not find it inspiring or motivating. It is seen as an archetypal image of Canada's past — standard or expected." What do you think of new polymer $5, $10 bills?